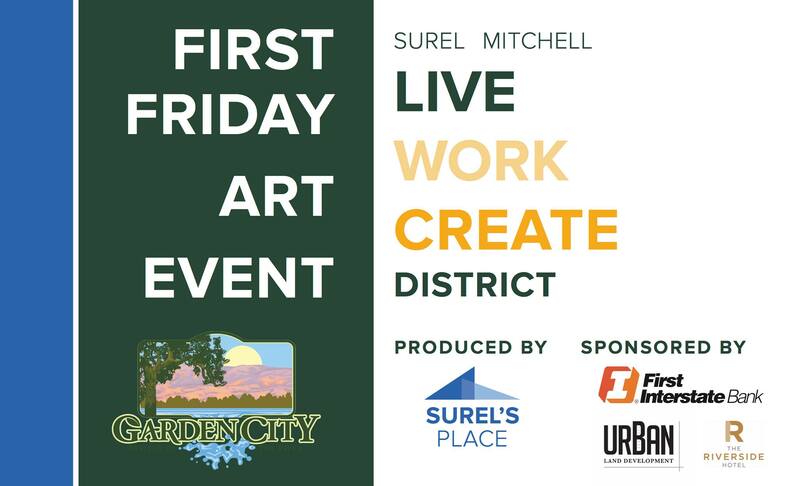 First Friday in The Surel Mitchell Live Work Create District in Garden City features over 20 venues and more artists from the Riverside Hotel to 38th Street. Venues also include Door #3, Garden City Projects, Gossett Landscape, Madacsi Studios, Push and Pour, Corridor Surf Shop, Serenity Soul Center, Studio 1212, Urban Gallery, The Visual Arts Collective, the Yardarm, and Zion Warne Glass. The Riverside Hotel and Urban Land Development are sponsoring a free shuttle from 6:00pm – 9:00pm which will run in a continuous circuit to all the different venues! First Friday is supported in part by First Interstate Bank, the City of Garden City, and Urban Land Development. 2018 Dates are: August 3rd, Oct 5th, and Dec 7th.